Yesterday I stopped by the grocery store and was in the check out line when I spied the groceries the women behind me put on the belt. Two bottles of sparking cider, a bag of collards, chicken stock, black eyed peas, and cornbread mix. I turned to her and told her: "I like your dinner menu. I want to come to your house to eat." We exchanged a quick laugh and kept it moving. Apparently this is some kind of New Year's tradition in the South and yesterday was my first time hearing about this. I only ate them once and it definitely wasn't New Year's the day I consumed them and deemed them inedible. *side eyes my momma* for making me missing out on years of fortune and good luck. I did a quick google research to learn more about this tradition. I learned the peas symbolize good luck. Some go as far to cook only 365 beans in a pot and add a coin into the pot. Greens indicate money and fortune. Cornbread is supposed to represent gold, but I agree with this author, it is a good accomplice for soaking up the peas. So it is decided, I'm having this for dinner tomorrow night. I really don't know the first thing about making black eyed peas. I remembered I didn't like them once, but my palette has since matured and I'm ready to give them another chance. 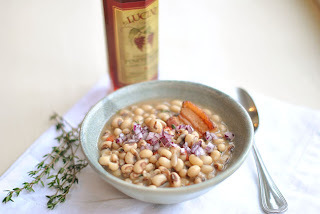 I just happened to browse over to Pioneer's Women cooking site, and found an awesome and simple black eyed pea recipe that includes cooking my peas in bacon fat. Yaaaasss! Many blessings and good luck to you in the 2011 year... Lord knows, I need it.